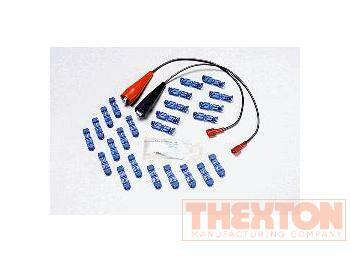 Easy method of accessing any 14 to 22 gauge circuit wiring, including ignition coil primary circuit. Tool is used to tap into circuits for voltage tests, oscilloscope wave forms, or other diagnostics. Features plastic terminals which snap on to wire and become permanent connectors for future diagnostics. Includes two jumper wires, 25 wire terminals, and one tube of silicone sealer. Additional terminals available as Replacement Terminal Kit Part No. 460A.